How do the “chore wars” affect intimacy? Before joining forces with her husband Shlomo to #RestoreMarriage as the Director of Engagement through TheMarriageRestorationProject.com, Rivka Slatkin was a household organizer extraordinaire! This segment combines both Rivka and Rabbi talking about household management (or a lack thereof!) plus marriage help resulting in a fun, lively segment! Are the following behaviors “Divorceable”? Most couples experience a marriage in which one of the partners are engaging in a particular behavior that is less than desirable. But are these behaviors reason to divorce? 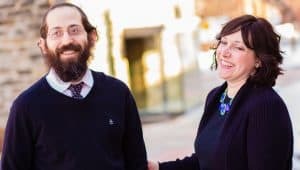 Rabbi Slatkin reveals the telltale warning signs for “divorceable” behaviors to help couples determine if they should divorce over the issue/behavior or not! The answers may surprise you! True or False? Good spouse = good parent? Bad spouse = bad parent? Why in order to be a good parent, you must first be a good spouse. In this segment, Rabbi Slatkin speaks to married parents with children and teaches both marriage and parenting advice at the same time. For those married to Unwilling Partners in a State of “Stuck”. 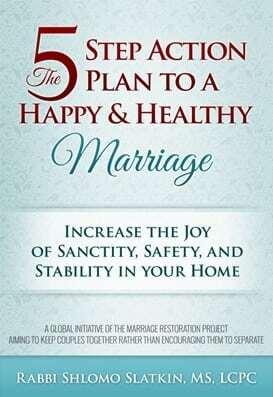 When you’re married to someone that is unwilling to get help, unwilling to work on themselves, unwilling to do anything that remotely speaks of self growth or self improvement, what can you do? In this segment, Rabbi Slatkin teaches the lone partner some techniques, that when applied, will naturally bring your spouse out of their state of “stuck” without any coercion or compromise! In-laws or Out-Laws? 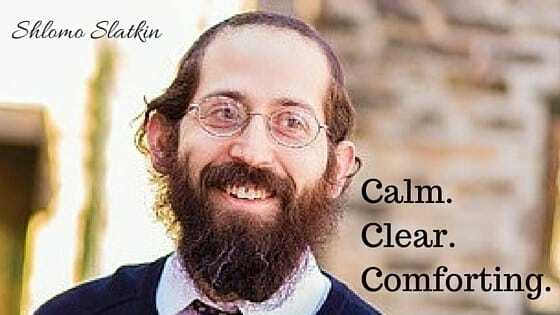 Rabbi Slatkin shares what you can do when you cannot stand your spouse’s family, how to feel safer during holiday time, and how to not your spouse’s relationship with his/her parents absolutely sabotage your marriage! How Self-Growth can Wreck a Marriage. It seems like self-growth should be praiseworthy. But a common problem, this day in age, is when one spouse thinks that they are “more enlightened” than their spouse. This segment explores the problem and how to avoid the all too common phenomenon of “outgrowing” your spouse. To see our press kit for relationship tv segment ideas click here. To book Rabbi Shlomo Slatkin and/or his wife Rivka for a Relationship TV or Radio appearance, send an email to: info at themarriagerestorationproject.com or call 443-570-7598.